The Barnstormers are Lancaster’s own minor league baseball team, part of the independent Atlantic League of Professional Baseball. Games at Clipper Magazine Stadium are exciting, with between-inning events to delight the entire family. Plus, there isn’t a bad seat in the house, all at an affordable price, with great food options. Check the Barnstormers schedule for available home games from April through the beginning of September. Just because it’s summer, doesn’t mean the kids can’t be learning something. It’s even better when that learning is fun. Tucked away in the northeast corner of the city, the Lancaster Science Factory offers hands-on exhibits for kids relating to areas of science like electricity & magnetism, light & vision, fluid dynamics, and more. Did we mention it’s fun? Our region boasts some great miniature golf courses with a variety of challenge levels. One of our favorites is Village Greens Miniature Golf in Strasburg. This mini golf course features two courses (41 holes) in a lush setting, plus some pretty tasty milkshakes and hand-dipped ice cream. Other great courses can be found at Lost Treasure Golf, just up the road from AMT, and Water’s Edge in Bird-in-Hand. Get ready to tee up with the family for a fun competition. Fore! If you want mini-golf and more, just a half hour up the road near Hershey, PA is Adventure Sports. From go-karts and bumper boats to batting cages, laser tag, and an escape room, there’s something for everyone for a full-day of fun. Plus, there’s an indoor arcade and ice cream parlor for when you need to cool off. A perfect fit for the more artistically-minded, The Bead and Pottery Works is located in the heart of historic downtown Lancaster. With a wide variety of options for any age, you can make your own pottery. You can also make your own beaded jewelry and create something wonderful to wear to your chosen show at the American Music Theatre! 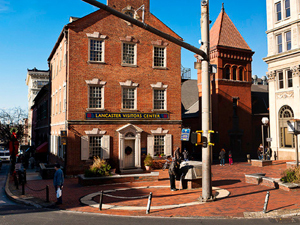 Did you know the country’s oldest farmer’s market is located in the center of Lancaster? Three days a week vendors converge at Lancaster Central Market offering fresh produce, amazing baked goods, and the finest meats and cheeses. Plus, you can find a wide variety of ethnic foods and local favorites. We recommend a whoopie pie or a jar of chow chow. A great place to grab some breakfast or lunch or just browse for gifts, Central Market is open on Tuesdays, Fridays, and Saturdays. Just a few blocks north of Central Market is one of the coolest and most unique blocks of shopping you’ll ever see. Uptown Lancaster covers the 300 block of North Queen Street. Between vintage shops, collectibles & antiques, restaurants, and other unique specialty shops, you’ll find plenty to keep you busy. Two of our favorites stops are Building Character and Mommalicious. Looking for a little bit of pampering while in town? Plum Salon & Spa on the northwest edge of the city offers a variety of services from hair cutting and styling to a nice mani/pedi. Or, if you’re feeling a bit more indulgent, try one of their facials, or even a couple’s massage! Did we mention the complimentary drinks? Plus, when you’re done, you can hop over next door to The Bakers Table and indulge some more with incredible baked goods and coffee. If there’s one thing we have here in Lancaster, it’s an amazing arts community. 2013 marked the 50th anniversary of The Lancaster Summer Arts Festival. The festival features music, film, photography, and a variety of art exhibits and events throughout the city all summer long. Check out their calendar for a list of events available when you’re in the area. Lancaster is filled with lots of public art, and some lucky summers include the return of the Keys for the City exhibition. Hosted by the local nonprofit, Music for Everyone, the exhibit includes twelve pianos, all painted and designed by local artists, and placed throughout the city. Locate them on the map and then take your turn at tickling the ivories and singing your favorite show tunes! Over on N. Mulberry Street, about four to five blocks from Lancaster Central Market, is Callaloo Trinidadian Kitchen. This is a great place to get a taste of the Caribbean. It’s a small place with delicious food and a family atmosphere. It’s a popular spot and can get busy, so reservations are recommended just to be safe. If you like comfort food, Lancaster County has diners galore. One of the highlights of our area is the Route 30 Diner, less than a mile east of the American Music Theatre. It’s open 7 days a week, 6 a.m. to 8 p.m., which makes it the perfect place to fill your tummy before or sometimes after the show! Heading back into Lancaster City, and also located on N. Mulberry Street, is The Fridge. If craft beer is your thing, The Fridge has over 400 varieties of bottled craft beer at any time and ten on tap. Plus, they offer hand-crafted artisan flatbread pizzas made from locally-sourced ingredients. Smack dab in the middle of Lancaster’s 300 block of N. Queen Street, Rachel’s Cafe & Creperie has become one of the go-to places for residents and visitors alike. Whether you’re looking for a meal or just dessert, Rachel’s has a crepe stuffed with goodness just for you. It’s open for breakfast, lunch, and dinner. You won’t leave hungry! Built in what used to be a traditional home, this eatery is just a ten-minute drive west of the American Music Theatre. The Brasserie Restaurant & Bar offers a broad selection of menu items in a casual fine dining atmosphere and is family friendly. Make sure you try the tomato bisque! These are just a few of our favorites, but, rest assured, there are tons of options to choose from wherever in Lancaster County you happen to be. Also, all of our employees live in the area, and each has their favorite go-to destinations throughout Lancaster County. Feel free to ask any of us for suggestions, and you can always find more information through the Pennsylvania Dutch Convention & Visitors Bureau.